Amateur poker players from across Great Britain will flock to Poker in the Park to take part in the live action, as the free poker festival teams up with the pub poker leagues of Great Britain. Organisers expect thousands of players to participate in the turbo sit and go’s being held around the clock in two giant Poker Domes. 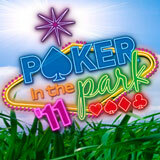 Poker in the Park, which hits London’s Hanover Square on September 2nd and 3rd, is Europe’s biggest free poker festival. As well as all the live action, visitors can expect music, entertainment, free strategy lectures from some of the world’s top players, live tuition, autograph signings and photos, cut price deals on the latest books and merchandise, surprise celebrity guests and more.